HomeHome /	/ Blog / Smoky Mountains / The Top 10 Ways to Enjoy the Fall Colors in the Smoky Mountains Happening Right Now! Of all the many things to do in Gatlinburg and the surrounding Smoky Mountains, one of the most popular is to view the stunning Fall colors. And here are the 10 best ways to experience the Fall colors happening right now – October 25, 2013 – in the Gatlinburg and Pigeon Forge area of the Smoky Mountains. 1. Take a scenic drive. Early morning is always best to avoid traffic, but even heavy traffic has a gentle feel to it as drivers gaze at all the scenic splendors of the Smokies. Take the Little River Road through the Park and drive the Cades Cove loop road this weekend and early next week – this area is now saturating with Fall color, check this link for a recent picture. Also the drive to Elkmont, Newfound Gap Road and Deep Creek are recommended. 2. Arts & Crafts. This weekend is the final two days of the Gatlinburg Craftsmen’s Fair ending on October 27. Dollywood is looking great right now with lots of color, as well as its Gospel and Harvest Celebration happening all month with music and crafts throughout the park. And remember the Great Smoky Arts and Crafts Community spread along the 8-mile loop of scenic drive perfect for the Fall colors. You could amble along this route for days if you wanted to visit every studio, or sit on the benches and just gaze at things. Check our guide to this month’s Harvest of Crafts. 3. Ride a horse. The view of the outdoors is better from the back of a horse. Fortunately there are many riding stables in the area, with gentle horses great for all the family and well used to the trails you can’t see from the highway. And if your riding days may be over (or not yet begun) take a hay ride instead. Check our guide to horseback riding stables. 4. Ride the Aerial Tramway. 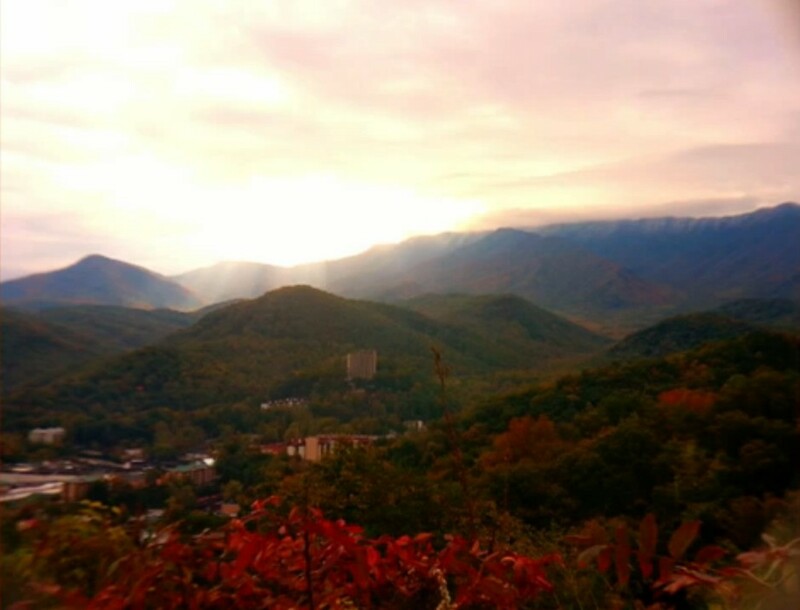 Take a ride up to OberGatlinburg and catch a taste of Octoberfest happening all this month. The ski area has started making snow but the Fall foliage is all around still and the view from the Tramway is fantastic. 6. Climb the Space Needle. 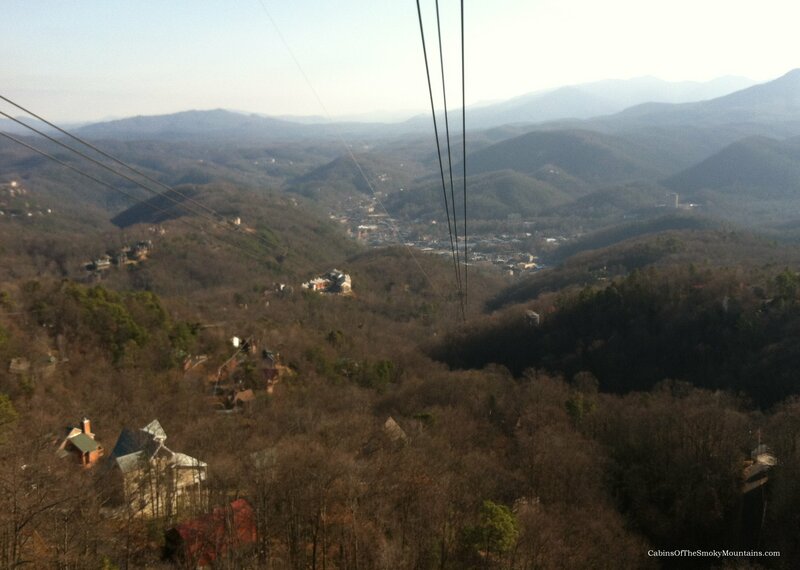 Ride the glass elevator over 400 feet to Gatlinburg’s highest point. From the observation deck of the Gatlinburg Space Needle you can gaze out on a 360 degree-view of the Smoky Mountains. 7. Ride the Wheel. Newly opened this year is the Great Smoky Mountain Wheel at The Island in Pigeon Forge. It’s a 200-ft tall observation wheel with enclosed cabins offering spectacular views for all the family of the surrounding mountains. There are also shops for the grown-ups and attractions for the kids while you’re there, especially with Halloween coming next week. 8. Take a Hike. Hiking the trails of the Smoky Mountains brings you up close to the foliage and takes you places the automobile can’t go, or even a horse. The Park Service today recommended these hikes for the Fall colors: Medcalf Bottoms Trail to Little Greenbrier Schoolhouse, Sutton Ridge Overlook (Lower Mt. Cammerer Trail), Kephart Prong Trail, and the Juney Whank Falls Loop trail in Deep Creek. 9. Take a stroll. Hiking is pretty rigorous, when sometimes all you want is just to stroll and enjoy the scenery and the Fall air. There are 5 city parks all told in Gatlinburg and Pigeon Forge – although it’s easy to forget this with that one great big Park so close by! Check out Patriot Park and City Park in Pigeon Forge, and Mynatt Park, Herbert Holt Park and Mills Park in Gatlinburg. So there it is. You can either sit peacefully and let it all surround you, or get out and move around through it. Both ways are recommended – but do enjoy these Fall colors of 2013 here in the Smoky Mountains!